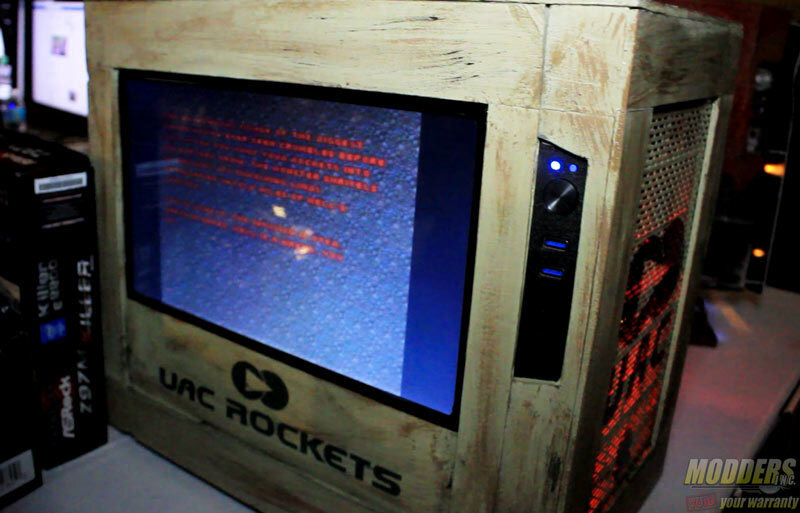 Once upon a time, not so far ago, USB became the most common standard for connecting peripherals to our computers. 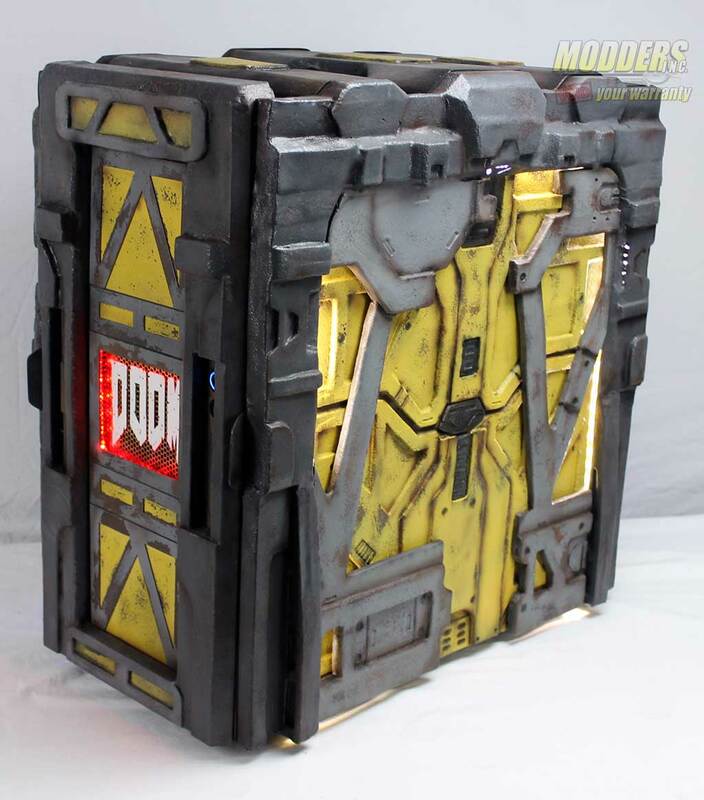 It has also received several upgrades over the years, including this year’s jump to USB 3.1. 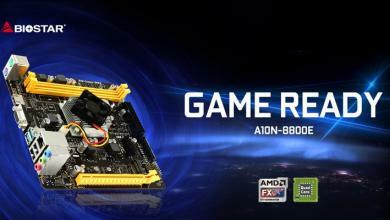 Needless to say, PC builders are going to find these new interfaces on their forthcoming motherboards from all brands, but ASRock’s X99 and Z97 motherboards have more up their sleeves. Besides the traditional Type-A connectors, they’re going to be the first in the world to carry the Type-C 10 Gb/s SuperSpeed+ USB 3.1, which supports next generation mobile devices. 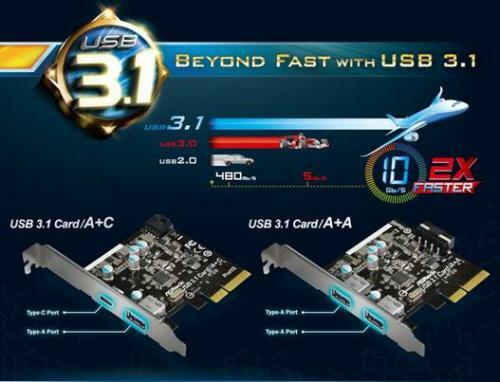 The main attraction of the next generation SuperSpeed+ USB 3.1 is that it has doubled the data signaling rate of the former 5 Gb/s USB 3.0 to 10 Gb/s for new USB 3.1 supporting devices. In other words, transferring files from storage devices is about to become two times faster, while these most common Type-A connectors are still backwards compatible with the current USB 2.0 and 3.0 devices. ↑USB 3.1 boosts the current data rate from 5 Gb/s to 10 Gb/s! 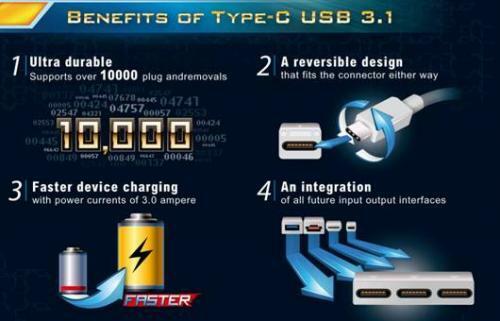 Something else worth mentioning is the birth of the new Type-C USB 3.1 interface, which purposedly would serve as an integration of all our future input output interfaces. This breaks the compatibility with the existing Type-A connectors, but on the bright side, after years of keeping fingers crossed, frantically fumbling Type-A USB connectors behind computer cases in hope of getting the correct orientation, the long overdue reversible Type-C USB interface has finally arrived, adding one more entry to the things certain in life. 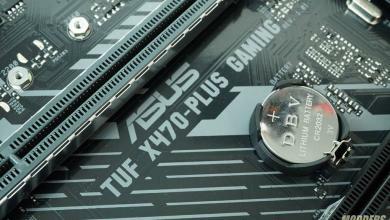 Moreover, during this transition period, ASRock is planning to support both Type-A and Type-C USB 3.1 connectors. Other merits of this new Type-C interface include smaller size, which is inevitable since the sizes of our devices are shrinking as well. 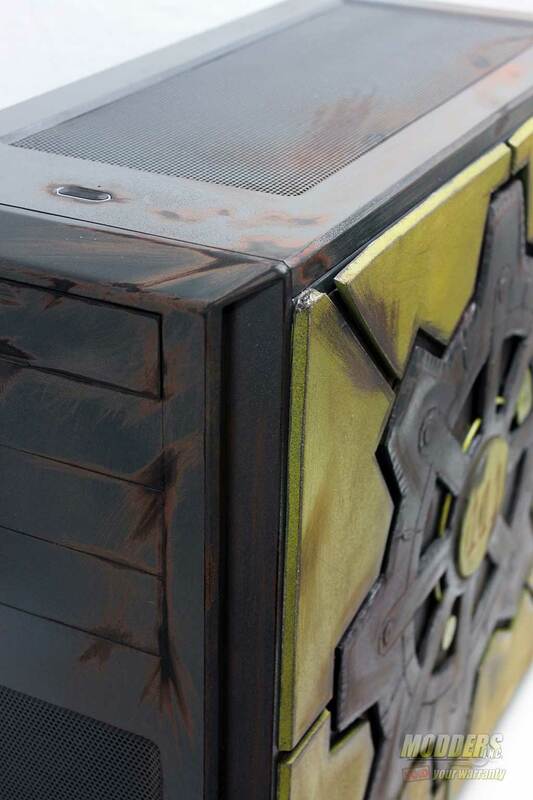 Strengthened durability to support over ten thousand plugs and removals, and a huge leap from the former 0.9 ampere power current on USB 3.0 to USB 3.1’s 3 ampere power currents for extra fast device charging. 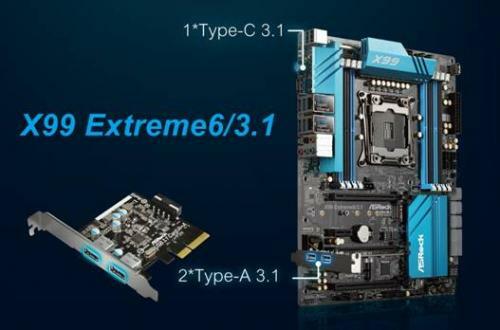 One of the world’s first motherboard to be equipped with Type-C USB 3.1 will be ASRock’s Z97 Extreme6/3.1. 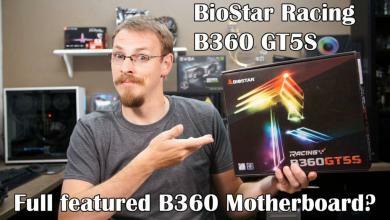 Much like its previous version, this motherboard will bear ASRock’s Super Alloy features, a PCIe Gen3 x4 Ultra M.2, quad CrossFireX, quad SLI, and Purity Sound2. 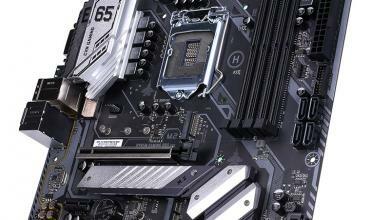 Furthermore, apart from the 10 USB 3.0 and 5 USB 2.0 connectors onboard, this motherboard also sports an USB 3.1 add-on card with both a single USB 3.1 Type-A port and a Type-C port. 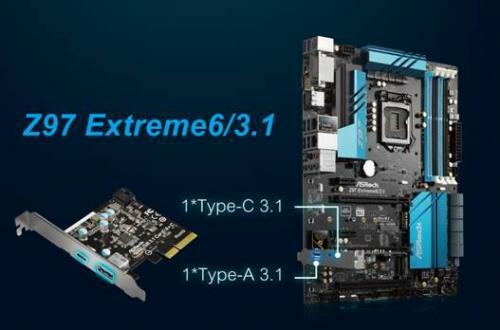 Another new piece of Super Alloy Series motherboard that’s getting a dose of USB 3.1 is ASRock’s X99 Extreme6/3.1. 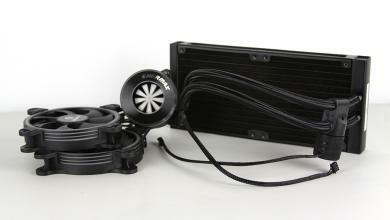 It will also come with Ultra M.2, 3-Way CrossFireX or SLI, and Purity Sound2. Plus an USB 3.1 add-on card that supports two USB 3.1 Type-A ports, an onboard USB 3.1 Type-C port for next generation devices, and a bucket load of traditional USB ports as well.